Softcover, 8 in. x 11 in. 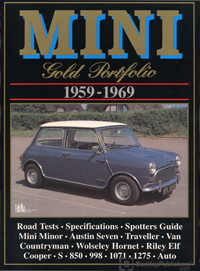 This Mini Gold Portolio: 1959-1969 is a collection of 48 original articles compiled from the pages of Australian Motor Sports, Autocar, Autosport, Car-South Africa, Cars & Car Conversions, Motor, Motoring Life, Motor Sport, and Wheels. The information collected in these reprinted articles includes 20 road and track tests, plus specifications, touring and long-term reports. The Mini was a triumph of design by Alec Issigonis who produced a thoroughly driveable and likeable economy car. The neat styling immediately gave it more character than any other economy car of the time. Under BMC's badge engineering system the original Morris Mini Minor became an Austin Se7en and with a boot became the Riley Elf and Wolseley Hornet. It always had a strong sales basis. This is a book of contemporary road tests, new model introductions, specification and technical data, long-term tests, competition, history.